But that doesn’t mean you can forget all about psoriasis care when summer arrives. 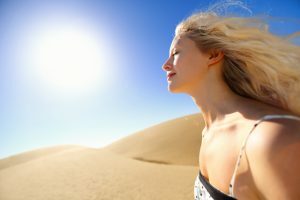 In the treatment of psoriasis patient, summer can be a double-edged sword. While humidity and the sunshine can actually help soothe symptoms, air conditioning and chlorine can dry out skin and trigger flare-ups. Treating Psoriasis during warmer months is comparatively quick and effective which will help people to wear trendy clothes and flaunt all throughout the season. Sunburn is an injury to the skin. Psoriasis forms at the site of an injury (Koebner phenomenon — and as many as 50 percents of people with psoriasis experience it) As part of the treatment of psoriasis also it is advisable to use a mineral sunscreen containing zinc or titanium dioxide. Protect your scalp by wearing a hat, wear a rash guard style swim shirt at the beach, and cover up with lightweight, loose clothing. While the humidity is good for your psoriasis, many aspects of summer, like air conditioning and chlorine, can lead to dry skin. Compensate this by applying extra moisturizer. In the case of chlorine, shower after swimming to minimize any potential irritation. Keep Bug Bites away as Insect bites can also trigger Koebner phenomenon, so protect yourself from mosquitoes and other bugs with a heavy layer of insect repellent. Stress becomes a hurdle in the cure of psoriasis. Take advantage of things that can relieve stress. Go on a vacation especially to beaches. Both you and your psoriasis will have a good summer. The end of a long winter can be good news for people taking treatment of psoriasis. In fact, according to a 2013 study, the level of salt concentration in certain bodies of water can enhance the transmission of UV light therapy. So trek to the beach, the combo of salt water and careful exposure to UV rays can make a dip in the ocean a great way to help ease your irritation this season and will make your vacation joyful. Vacation to the beach and above that to relieve stress cocktails are best to indulge…BUT..Heavy drinking can reduce your response to psoriasis treatments, and alcohol can have dangerous side effects when combined with certain psoriasis medications. Regularity is the key to controlling, treat and cure psoriatic lesions. You are what you eat, and so is your psoriasis. Empirical evidence suggests that many patients experienced reduced flakiness and itching after cutting down on foods containing high amounts of sugar, processed flour, caffeine, and gluten. To know more about homeopathic treatment for Psoriasis you may contact our doctor at +91 2266888888 or write to us info@lifeforce.in.